This week's Daily Record column is entitled "2012 technology trends for large law firms." Earlier this month, the American Lawyer released its annual technology survey results. The Am Law Tech Survey 2012 compiled the responses of 83 Am Law 200 CIOs and technology chiefs regarding their law firms’ use of technology over the past year. The end result was clear — large law firms were no more capable of resisting the tidal wave of consumer-driven demand for cloud and mobile computing than any other industry. For example, the most interesting trend from this year’s results was that law firms were giving in to the inevitable, shifting away from typical enterprise-friendly devices and toward those more suited for consumers, especially when it came to mobile devices. Specifically, there was a decided shift from law firm use of familiar, clunky BlackBerry phones to the more nimble and consumer-friendly Apple and Android smartphones, with 88 percent of respondents expecting a decrease in BlackBerry users and 4 percent reporting that they would cease BlackBerry support altogether. Interestingly, iPhones were the most used device, with 99 percent of respondents indicating that there were iPhone users within their firms and 75 percent reporting the use of Android devices. Tablets are also influencing purchasing decisions. When it came to new hardware, 37 percent of respondents indicated that there were plans to add a tablet to hardware purchasing decisions for individual attorneys in the near future, with 25 percent planning to issue attorneys a desktop and a tablet and 12 percent planning to issue a laptop and a tablet instead. And, 8 percent of firms reported that they already supplied their attorneys with tablet computers. The use of cloud computing by large law firms is also increasing, albeit at a slower rate than that of solos of small firms. Nevertheless, there has been an uptick of cloud computing use, with 74 percent reporting using hosted computing services, a decided increase from the 65 percent that reported using these services in last year’s survey. And, 50 percent reported an increase in the use of cloud services compared to the prior year. 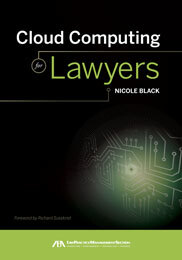 But how did respondents use cloud computing in their law firms? 63 percent used it for e-discovery and litigation support, over 37 percent used the cloud for human resource matters, 38 percent used it for email management, 13 percent reported using cloud services for data storage, 7 percent used it for billing and 8 percent used cloud-based platforms for document management. The main cloud computing benefits cited by respondents were simplified support and maintenance (83 percent) and the reduced need for in-house servers and other hardware (44 percent). Finally, the survey results indicated that social media use by large firms is also on the rise, with 75 percent of respondents indicating that their firms used social media as part of their firm’s marketing strategy. Of those firms, 90 percent used LinkedIn, 64 percent used Twitter and 61 percent used Facebook. So the results are clear — like most other industries, large firms are not immune to the long-reaching effects of the Internet and mobile computing. These new tools are changing the ways that we interact, communicate and conduct business and ignoring the impact of these technologies upon our societal landscape is no longer an option. Accepting and embracing 21st century technologies is the most reasonable course of action and, at long last, law firms are doing just that. It’s been a long time coming. Facebook, juries and mistrials, oh my! This week's Daily Record column is entitled "Facebook, juries and mistrials, oh my!" Earlier this month, local criminal defense attorney and prolific author, Gary Muldoon, brought to my attention a very interesting Supreme Court of Kentucky decision that was issued in September, Sluss v. Commonwealth, 2012 WL 4243650. This case addressed allegations of juror misconduct in a criminal case resulting from Facebook “friendships” between the mother of the victim and two jurors. Despite requests from the judge during voir dire regarding social media and existing online relationships, the jurors denied any connection to parties and witnesses to the case and the victim’s mother denied that she had a Facebook account. Nevertheless, it turned out that there was a possibility that two jurors and the victim’s mother were likely “friends” on Facebook. Accordingly, the defense appealed, alleging, in part, that the trial court erred in denying the defendant’s motion for a new trial on that basis. In reaching its decision, the court considered an assortment of interesting issues, including the nature of Facebook “friendships,” the effect of Facebook connections upon a pending trial, and the ethical obligations of lawyers when mining social media for evidence. In other words, this case covered it all: 21st century relationships, the social media/litigation clash and legal ethics. Next, the court considered the ethical issues presented when lawyers search social media for evidence to support their client’s case. The court adopted the standards established in the New York County Lawyers’ Association Committee on Professional Ethics, Formal Opinion No. 743, which I discussed in January 2012. Accordingly, the court held that lawyers may research prospective jurors by viewing publicly available information on social media sites, so long as doing so does not cause the juror to become aware of the monitoring. The court then explained that ethics guidelines prohibit lawyers or their agents from engaging in deceit in order to “friend” or otherwise connect with a juror in order to view social media data which is not publicly available. This conclusion makes sense, since to hold otherwise would encourage lawyers to engage in deceit and misrepresentation when mining social media for evidence, which is a clear violation of ethical standards. All in all, this was a really interesting and informative decision — one that offers continuing evidence that social media is a phenomenon that simply can’t be ignored. Simply put, lawyers who seek to provide zealous and effective representation on behalf of their clients must have a thorough understanding of social media and its effect on litigation. Anything less arguably amounts to an ethical violation at best and malpractice at worst. 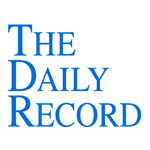 This week's Daily Record column is entitled "Cloud computing for lawyers – chipping away at risk." Cloud computing, where your data and software are stored on servers owned and maintained by a third party, has been around for years now and offers solo and small firm practitioners many benefits, including affordability, flexibility and agility. Even so, there continues to be a lot of confusion about it. In fact, according to the results of a survey commissioned by Citrix in August 2012, nearly one third of the 1,000 American adults surveyed believed that cloud computing was a “thing of the future,” even though 97 percent of respondents, apparently unknowingly, used cloud computing to shop online, bank online, and to interact on social networks, such as Facebook, Instagram, Pinterest and Twitter. Lawyers are in the same boat. For example, most lawyers have emailed with clients who use Gmail, Hotmail or Yahoo mail. And yet the majority of lawyers still don’t realize that when they do so, they are using email services provided via cloud computing to communicate with their clients. And, if their clients choose to save their emails in their email account, rather than delete them, the confidential client information contained in their emails is being stored in the cloud. So, even though most lawyers have undoubtedly used cloud computing services at one time or another to communicate with their clients, some continue to be hesitant about using cloud computing platforms in their law practice and remain unconvinced that the benefits of cloud computing outweigh the risks. However, over time, the cost/benefits balance has shifted in favor of cloud computing as it becomes a more familiar technology and as cloud computing providers have responded to consumer worries by implementing procedures and mechanisms to reduce perceived risks. For example, one major area of concern has been the potential loss or inaccessibility of data in the event of an isolated geographic disaster, such as Hurricane Sandy. In order to alleviate that risk, many cloud computing providers, especially those that cater to businesses such as law firms, have put in place redundant back up procedures. Oftentimes data is backed up multiple times a day to at least 2 servers located in different geographic regions, a concept called geo-redundancy, in order to ensure that data is never lost and is always accessible. Another area of concern expressed by lawyers is the perceived financial instability of legal cloud computing providers, many of which are small start ups. The fear is that if their cloud computing provider becomes insolvent, the law firm’s data may be lost or otherwise become inaccessible. However, this too is becoming a non-issue as cloud computing becomes more commonplace and as a result, providing cloud computing services becomes a more profitable business endeavor. For example, the cloud computing company for which I work, MyCaseInc.com, which provides a complete law practice management suite for lawyers, was recently acquired by the California-based AppFolio, a company backed by $30 million in venture capital funding and founded by the same people who created GoToMeeting and GoToMyPC. If there was ever any doubt about the stability and sustainability of MyCase, it was all but eradicated by news of this acquisition. Similarly, Clio, another company that also offers a cloud-based law practice management system, announced earlier this year that it had raised $6 million in financing, the news of which was viewed as proof that legal cloud computing had come of age. So, as is the case with most new technologies, the legal profession was slow to embrace the benefits of cloud computing and was understandably cautious about its perceived risks when it first emerged. However, cloud computing technology and its providers have grown and matured, thus alleviating many of the original concerns about the feasibility of its use by law firms. As a result, it is now perceived by many businesses, both legal and non-legal alike, as a viable and appealing alternative to traditional server-based computing. In other words, the scales are slowly tipping, as the risks are outweighed by the many benefits offered by this 21st century technology. Nicole Black is a Rochester, New York attorney and Director of Business Development and Community Relations at MyCase, an intuitive cloud-based law practice management platform for the modern law firm. She is also a GigaOM Pro Analyst and is the author of the ABA book Cloud Computing for Lawyers, co-authors the ABA book Social Media for Lawyers: the Next Frontier, and co-authors Criminal Law in New York, a West-Thomson treatise. She is the founder of lawtechTalk.com and speaks regularly at conferences regarding the intersection of law and technology. She publishes four legal blogs and can be reached at nblack@nicoleblackesq.com. WIN a Free Geminus Genius iPad Case! two copies of the JURYSTAR iPad app were up for grabs from the good folks at Litigator Technology. This month you can enter to win 1 of 2 Geminus Genius iPad cases. This case is reminiscent of the leather bound paper calendar cases that lawyers used to (and some still do!) take with them to court. It offers multiple viewing positions, includes numerous credit card and business card pockets, and there’s room for earbud and cord storage, among other things.If you’d like a chance to win, head on over to the MyCase blog and sign up! Earlier this week, it was announced that the company for which I work, MyCase, which provides an intuitive cloud-based law practice management platform for lawyers, was acquired by AppFolio. Words cannot express how excited I am by this news! Appfolio, a company backed by $30 million in venture capital and which provides cloud computing services for a number of verticals, including property management and secure virtual data rooms, is an amazing company made up of amazing people. It was founded by the very same people who created GoToMeeting and GoToMyPC. The MyCase team will remain intact, with fellow attorney Matt Speigel at the helm, and we will work just as diligently as we always have to improve our product and exceed our customers expectations. The only change will be that we now have more resources to grow and develop the MyCase platform. Needless to say, I am thrilled to be a part of this tremendously talented team and am looking forward to making MyCase the best it can be!